Specifically, he wanted to know if I was a Sand County Almanac fan or a Monkey Wrench Gang member, and where I fell on the Aldo-Leopold-to-Edward-Abbey scale of ideas about wilderness preservation. “I lean much more towards Leopold and people like Wendell Berry,” he said. “Abbey just wanted it all to himself.” Collins, like the writers he admires, believes there is a way for humans to eat and drink and take up space without wrecking too much. 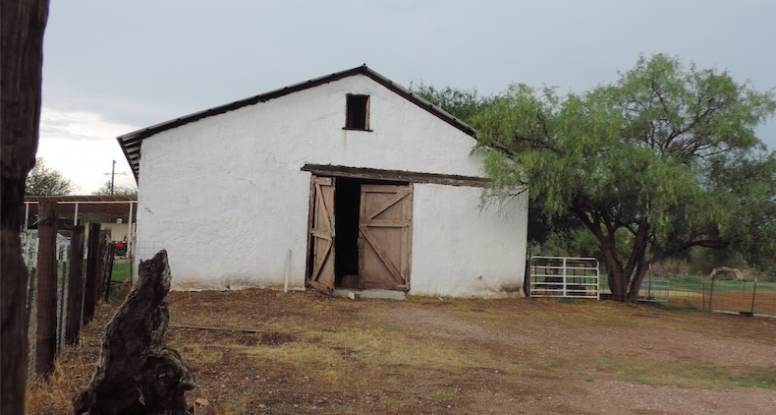 He operated a ranching business for three decades in the Canelo Valley, working first for the Sibold family, then buying some acreage along with grazing permits for surrounding state and federal lands. His background was in epidemiology, which, he said, is the ecology of tiny, disease-causing organisms, so he had a handle on ecological principles. Disease is perhaps the prime example of how humans are part of a broader ecology. Then an endangered species of fish, the Gila Topminnow, appeared in Collins’ grazing lot. The Fish and Wildlife Service wanted all grazing in the Red Rock Canyon watershed to stop, which would have made Collins’ business a no-go. In many ways, it was a classic conflict between a federal agency and private ranches. But this experience with federal regulation prompted Collins to wonder if there was a way to run his business that also addressed ecological concerns. 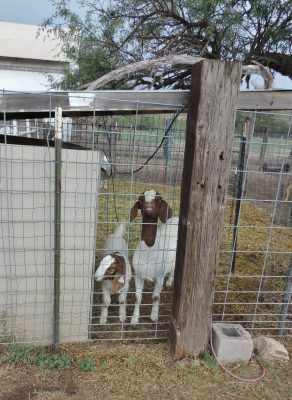 He and his neighbors formed the Canelo Hills Coalition to see if they could insure the health of the watershed just by adjusting their grazing practices. They brought in George Ruyle, UA’s sustainable rangeland management expert, who set up vegetation surveys. 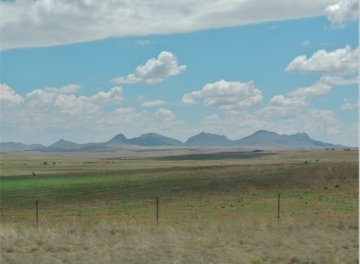 They monitored conditions and put up new fencing and water sources to control where cattle could go in each season. And they were considered successful, says Collins, “by the people who evaluate these things. The federal agencies and the university and my peers in the ranching industry.” Not to say the fish. Collins reminded me of some of my own family. Retired, but habitually dressed for outdoor work. A busy brain and sturdy opinions. Even his sense of humor and turn of phrase, and the way he pronounced a long period without water “drouth.” But what I liked most about Collins, and so many other people from the Patagonia area that I met during Southwest Field Studies in Writing, was their blend of practicality and idealism. Agriculture is an undertaking with a pretty clear rock bottom. But people around Patagonia think there must be a better way of doing things, and are willing to take a chance to find out. One evening I wound my way along the Santa Cruz River to talk to Dean Fish, manager at the Santa Fe Ranch Foundation. 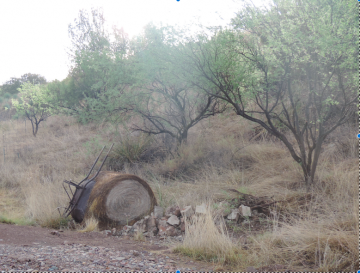 He situated me immediately: “We’re located about six miles north of the US-Mexico Border, northeast of Nogales, Arizona. The Santa Cruz River bisects the ranch, and so we have what we call uplands on both sides and semi-riparian river valley in the middle. 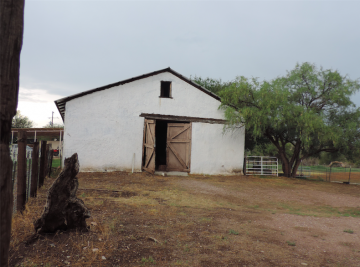 The main ranch is approximately 25 hundred acres of private grazing rangeland and about 65 acres of that is irrigated to provide forage for livestock and wildlife.” He spoke loudly over the hollering goats, and ignored the light rain falling as we sat in front of an adobe wall with peeling whitewash. Fish is a good communicator, knowledgeable, generous, and extraordinarily nerdy about cattle. Exactly the kind of person you might want at the helm of a foundation that provides not only beef, but also education, a model for management, and even an animal therapy program to the surrounding community. The Santa Fe Ranch Foundation employs people through the Santa Cruz Training Program, which connects developmentally disabled people to opportunities in the county. This ranch is a private business with its own bottom line, but it is operated by people who know how their business fits into something larger. When I asked Fish what principles guide his decisions around here, he talked about “the 30,000-foot view.” From 30,000 feet, this ranch is part of a landscape, these cattle are not the only ones who need the river water, and people who live nearby will always be part of the picture. I asked Collins and Fish a few of the same questions, and some they answered alike. When asked how they know what to do day-to-day as managers, they both answered, essentially: Go look. Get to know how water moves, how grass responds, how the animals look, and how weather impacts everything. Both Collins and Fish maintained long-term vegetation monitoring programs to make sure they had accurate information for their decision-making. Collins believes “fiction writers and bad movies and songs and all that kind of stuff” that romanticize agricultural life have done real harm to people’s understanding of where their food comes from. But I still find something romantic about this eminently practical, deeply observant experience of a place. I asked both men what it means for land to be healthy. I am interested in this question both practically and idealistically—the principles that guide decisions, and the practices that create them. I am interested in the 30,000-foot view and the view at the end of a microscope. He nodded. “But it does convey the sense that like human health, you have to have all your systems working. At my age they’re beginning to break down a little bit, so I understand. Things fall apart. It has that same sense. But how you evaluate it and describe it is difficult. “Multiple uses” has a dubious history in the U.S., and there is no hard-and-fast line between use and exploitation. But listening to Collins and Fish, I was imagining an ag industry with these priorities. Imagine for a moment that the economy exists to serve quality of life, and not the other way around.